Picked up the top two cards on my Post-War wantlist this past month - the Pele Alfa and Quigol! As you might expect, the Alfa came from Sweden and the Quigol from Brazil. It's awesome to get cards that are not only 60 years old but also originate in different parts of the world. The Alfa has a very sharp and vibrant image for a 1950's issue while the Quigol has perhaps the best design of any football set. The former is also more like a "card" while the latter is definitely a "sticker" in terms of its stock. Anyone else have either or both? Which do you prefer? IMO the Alpha is a much nicer card. Elegant, simple, classic design. Last edited by Exhibitman; 05-15-2018 at 06:51 PM. I have neither but like the Alfa more. Wow, those are terrific pick-ups! Been looking for both of those as well. Tough to find for a decent price now. It also feels like the amount of fake cards/fraud is on the rise for both examples. 3. It was Pele's international "stardom" moment when the world recognized him as the talent that he was. Although I very much love the design of the Quigol, I am pretty sure that it was not actually issued in 1958 based on my research. It is more likely a 1959-60 issue from what I can tell. BUT, the market has "voted" in terms of value and the Pele Quigol is the only soccer card that I am aware of that has sold for more than $10k USD. I also like the Titulares cards from Brazil, which I do believe are from 1958. Also the VAV card from Italy is from 1958 and given its relative rarity when compared to the other issues from 1958, I really like it as well. Looks not so good in the baggie. I do not like the baggies in the SGC cards, but I do love the holders when they have the right cut. But for whatever reason, I also do not like the BVG ones or the PSA ones. I guess the BVG holder looks better than the baggie SGC one, but it is personal preference. Congrats on picking up Pele's best cards. Are you going to send it to PSA? It looks VG-EX to me. - Since the card was manufactured in Brazil, which is Pele's home country, it was obviously handled more due to popularity. And I agree with Al that this card wasn't a 1958 issue, however, most collectors are probably aware of this and don't care. Look at the 1952 Topps Mickey Mantle card, for example. It is not his rookie, but Americans still go nuts over it. Thanks! Yeah, I’m lucky to have landed them at decent prices. Yup. 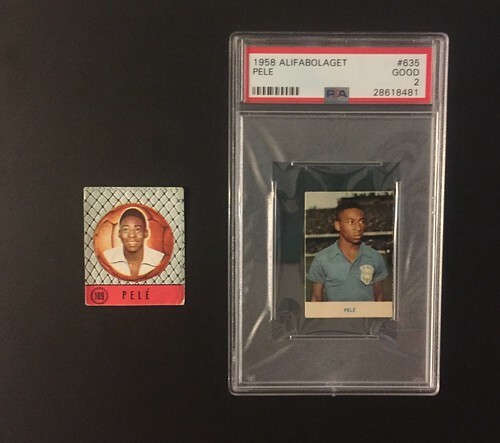 Though for what it’s worth, Messi Megacracks PSA 10 has sold for over 10K and there is a Pele Alfa PSA 8.5 in Heritage this summer that will surely top that. Thanks man. I will submit it eventually, but as illustrated above they don’t look great in any of the slabs. PSA probably does the worst job as far as presentation and I want to enjoy looking at and/or displaying the card. ... and there is a Pele Alfa PSA 8.5 in Heritage this summer that will surely top that. Thanks for bringing this to our attention. I also see that a PSA 8 Quigol will be auctioned off at the same time. This summer is a perfect time to list soccer cards because of the World Cup. PSA probably does the worst job as far as presentation and I want to enjoy looking at and/or displaying the card. But then why did you send all your prewar hockey cards to PSA? My V145’s? I had 18 free submisisons and several of the cards I had were already PSA. I also like the registry. That being said, after seeing how they slabbed them I regret it. Last edited by Anish; 05-26-2018 at 12:08 PM. Not to mention a PSA 10 Hemmets Journal Cassius Clay. That's going to be a interesting auction to watch. Whatever the Pele’s go for will be a bargain IMO. I didn't want to start a new thread to ask this question, but what is this Pele card currently up for auction through PWCC? I apologize for "outing" a current auction, but not much falls through the cracks at PWCC. The listing is not my card, but I was just curious about what it is -- a 1966 "Epoca" card. I have never seen it before, and could not find any information online about the card. Either way, it does not look like it is a high-dollar card. I was just wondering how rare it is, where it is from, etc. Last edited by Bored5000; 06-17-2018 at 01:45 AM. Don’t know anything myself, but perhaps Al does? Thanks for the reply. I was just curious because I could not find anything online about the card. I know a lot can change in the last five seconds of an auction, but I am surprised that a playing era Pele card is at $5.50 right now. Last edited by Bored5000; 06-20-2018 at 03:00 PM. Did anyone get that 1960s Brazilian sticker book with the Pele and Clay? It was a grand so I was nowhere near it.